Halytska Street View 4-room Apt. Property 1: Halytska Street View 4-room Apt. Property 41: Apartments "The Cultural Capital"
Нова!!! Сучасна 2-кім. в Центрі. Property 42: Нова!!! Сучасна 2-кім. в Центрі. Lovely apartment so close to the centre! We loved it. This place is just a 5 minute walk from the bustling old centre but far away from the noise and traffic. It is located on an old cobbled street next door to a fantastic &quot;olde-world&quot; caf&eacute;. The apartment was spacious, clean, the kitchen had all we needed, and the bathroom was large - with both a shower and separate bathtub. Alice was helpful and friendly. They have even prepared a booklet on all their favourite places which was really useful! The new modern shopping centre Forum is a short walk away and there is a 24 hour supermarket on the corner. We loved Lviv too. Location, location, location!! 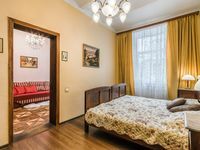 A lovely, large and airy apartment in a great location in Lviv. The hosts were wonderful and accommodating, and provided valuable information about the area and nearby restaurants and markets. 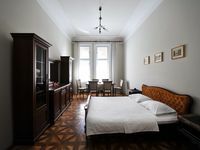 Its unusual to find two bathrooms and showers in Lviv apartments. Our party of 6 was very comfortable even on a hot day. We could not find a washing machine in the apartment though, and a few extra towels would be a welcome addition. We would stay here again and I will recommend this unit to friends.